I’ve been using Google Drive for years. It’s a brilliant package for freelancers and anyone else who loves organising their business systematically. All you need is a Google account. Umm… I can’t think of anything else! When I first discovered Google Drive, I was thrilled that it was so accessible, easy to use, and best of all, free. Which as a small business, or one starting out, is pretty awesome. Several years on and I couldn’t run my business without it. Here’s how I set up my whole business with Google Drive. I’m folder-obsessed. You probably know this about me already. I love making a dozen folders and organising all my documents that way. I do the same with email. It’s a simple system and means that everything has a place. This is what the homepage of my Drive account looks like. Along the left side are my main folders and within those are subfolders. Inside Admin for example are 2 subfolders - Invoices and Templates. In my Web Design Clients and Writing Clients are subfolders for each client. I save everything in there - documents, admin, invoices, briefs, any attachments they send me, etc. Most of it is just documents, so the file sizes are small. I’m barely making a dent into my 15GB free memory. As as many of my clients become repeat clients, it’s great to have easy access to our past projects together without starting over, or clogging up my own computer’s memory. Standard documents like proposals, quotes, briefs, contracts, copydecks, cover pages, invoices, testimonial requests, are so important in a freelancer’s life. Sometimes just developing these templates is the hard part. What should this look like? What should I include? How does everyone else do it? There’s a lot of questions and that’s where ready made templates are great. Google Drive has a whole bunch of them, so you have a starting point. And you can easily customise and make them your own. I’m always refining my templates so I can just grab them when I need to, change a few details and send them off. My aim is to spend 15 minutes max on a standard document, not 2 hours reinventing the wheel. When I perfect a template (at least for now), I tag it with a star, so I know not to accidentally alter it. Then when I need it for a project or proposal, I make a copy, edit it and move it into the right client folder. I set up a shared folder for all of my web design clients. When I book a new client and set up the prep work, I send them a link to a private Google Drive folder that’s shared just between us. I encourage the client to drop in all the files, images, text, ideas and content needed for the site. I provide subfolders to organise those elements and another for our admin. Shared folders mean that both the client and I have a safe, secure space to collect and organise all the website files, and we can both access it at any time. When the project starts, I’ll download all their images, optimise them and reload them back into the folder under a subfolder called Optimised images. If I’m editing the text, I’ll download a copy of that too, edit it in Word with tracked changes, then reload it to the shared folder. You can also share folders with a virtual assistant, contractor or anyone else you work with. No fancy project management software needed. Being Google, Drive integrates with most apps and systems. Google calls them Extensions and there’s a lot of them which you can access through the New menu. I’ve barely scratched the surface of integrations as I mostly use Drive for project management and word processing. But there is loads of potential. 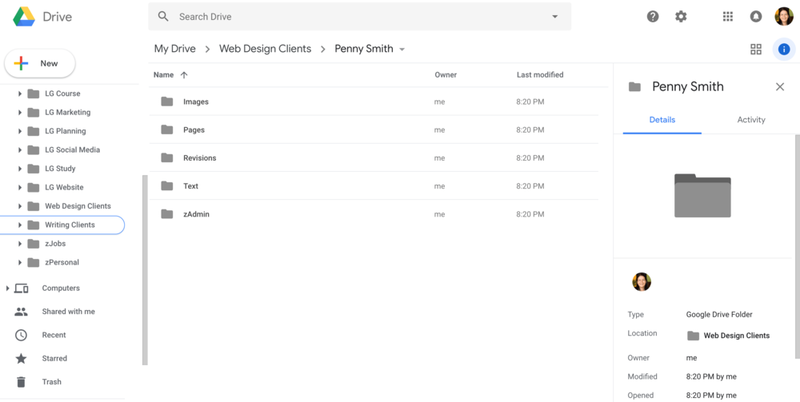 Here’s just a handful of the awesome capabilities of Drive extensions - photo editing, save emails as PDFs and add them to folders, electronically sign documents (very useful for contracts), compress PDFs, add bank-level encryption to files, and schedule emails with Gmail. You can share your documents with people with just a simple link. This works when sharing a folder like I do with my clients but also with sharing just a single document or spreadsheet. You can also choose whether people can edit or only view your file. You can invite specific people by email or copy and paste a link to add to an email. I also use these shareable links in Asana to reference my files. This saves me copying the actual file into Asana - it’s quicker and less clunky. 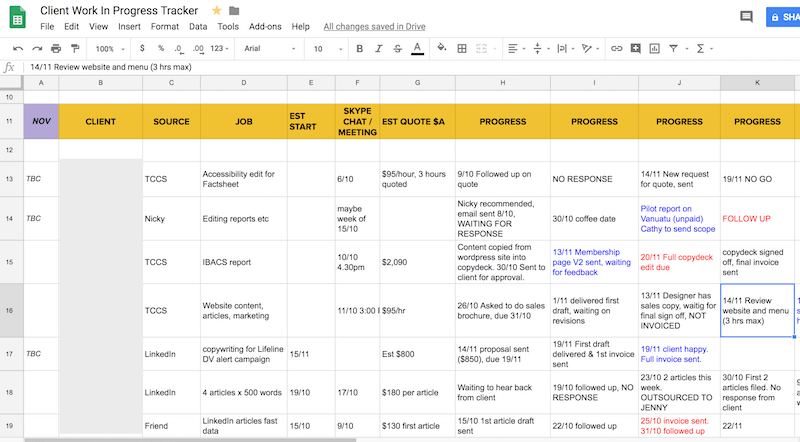 As well as Google Docs, there’s Google Sheets, which I use to track my client work progress, financials and new client pitching. I just created basic spreadsheets to do this, nothing fancy. I even had to ask my husband to do the formulas to add columns! I also use Sheets for SEO research as it’s great for columising everything and keeping tabs on word counts. There’s also Slides, which is similar to Powerpoint, and Forms, for creating surveys and clickable questionnaires. Are you convinced? Or are you already a fan? How do you use Google Drive? 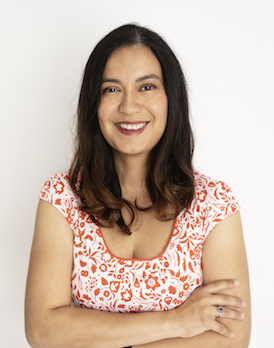 About the author: Lilani Goonesena is a freelance copywriter and web designer for businesses and organisations. Based in Canberra, she delivers smart, savvy SEO copywriting and professional Squarespace web design. She also writes an awesome newsletter on small business marketing, social media, blogging, web design and "all that online stuff".